Soba noodles are one of the most popular foods in Japan. It is a light but nutritious fast food made of buckwheat flour that has been eaten at any time and place for centuries. It is both a quick snack and a festive dish for special occasions. I know, buckwheat noodles do not sound too tasty but generations of Japanese soba craftsmen have been working on the techniques of extracting the best taste from buckwheat grains for centuries. There are different types of soba noodles that are served in many ways. It’s a simple, healthy and nutritious dish that can also be very sophisticated. Soba noodles are made from buckwheat grains which in Japan is called soba. In most cases buckwheat is sown in mid-summer and harvested in October or November. In Japan, it has been grown for thousands of years. It grows even in poor soil and in regions with extreme temperature fluctuations. It ripens quickly and can be harvested 75 days after sowing. In ancient times, most of the rice that farmers cultivated had to be handed over to regional landlords. In the upland areas where it was difficult to grow rice, buckwheat was an important source of nutrients for farmers’ families. Originally, people cooked buckwheat in hot water or used flour to make dumplings or porridge. Compared to rice, buckwheat was certainly not an exclusive product but from the seventeenth century it spread throughout Japan. In the end, it has become an important part of Japan’s culinary culture. When Shogun Tokugawa founded his capital in Edo, the area was largely undeveloped. Workers came from all over the country to work on infrastructure projects such as reclaiming land from the shore of the bay. Many men have left their homes and families. In order to satisfy their nutritional needs, numerous canteens and street stalls were created throughout the city serving simple dishes, including soba. However, it is much more difficult to knead and form a dough from buckwheat flour than from wheat flour. Long, thin buckwheat noodles easily crumbled when boiled in water. At that time udon noodles were extremely popular and were the basic ingredient in the west of the country. Udon was also considered better in Edo but over time people from Edo began to prefer food grown in or around the city. The soba noodles were cheap and quick to cook but people wanted food that would be also tasty. Then a breakthrough was made in preparing soba. A recipe was developed in which the pasta was steamed instead of being boiled in water. Thanks to this, noodles didn’t fall apart. Soba was served with miso and other spices. The inhabitants of Edo were known for their demanding and love for new tastes. At the beginning of the 18th century, it turned out that if you mix buckwheat flour with wheat flour, you can make pasta that does not break apart during cooking. This led to the creation of a long and thin soba noodles that we know today. The soy sauce that was produced at Edo was much more full-body than the sauce made in western Japan. This new condiment had a rich flavor which particularly suited the simple taste of the soba noodles and this combination was very quickly accepted by people. At the end of the 19th century, there was around 3,600 soba shops in Edo and the same number of street stalls. Originally, soba was an survival food for people who had no rice to eat and then it began to gain popularity throughout Edo. The first step to making the soba noodles is to grind the grain in a mill to produce buckwheat flour. This is mixed with wheat flour or other ingredients, then water is added and the dough is kneaded by hand. It should be done very quickly, so that the dough does not dry out. During kneading, the whole air should be pushed out of the dough and it should be formed into one large lump. The dough is then rolled with a special rolling pin until it’s around 1.2 millimeters thick. The dough sheet is folded many times and then cut into narrow, even strands. Raw noodles are usually boiled in hot water for 30 seconds, however, the time depends on the texture of the dough. Then the soba is ready to serve. There are different styles of soba noodles. 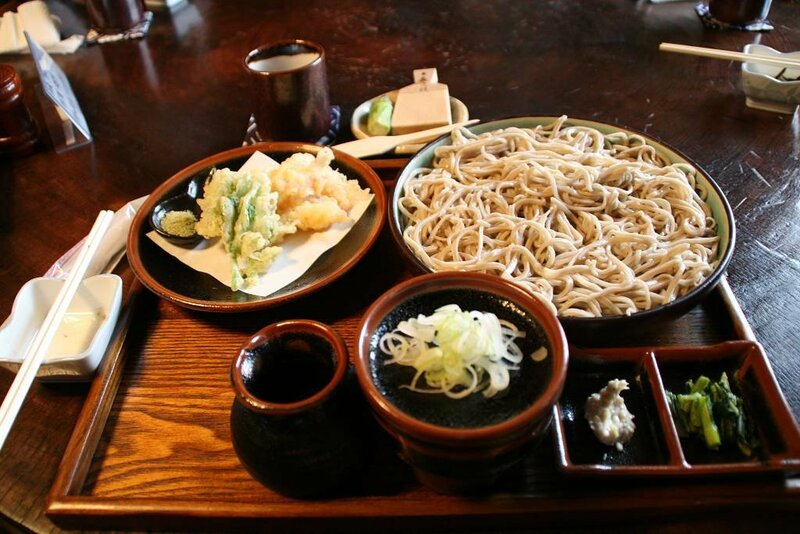 Ni-hachi Soba consists of two parts of wheat flour and eight buckwheat flour parts. The dark brown Inaka Soba has a firm consistency. Dattan Soba made with tartary buckwheat is gaining popularity recently because it is very nutritious. Sarashina is a real king among soba noodles. It has a white, translucent appearance and only a few pasta makers have the skills to create this soba quality. It is made of a special Sarashina flour which uses only the core of the buckwheat grains. No other type of flour is added to hold it together. That’s why Sarashina Soba is so smooth and has a perfect consistency. Forming pasta from the Sarashina flour dough is a challenge requiring the highest skill. Instead of cold water, the Sarashina flour is mixed with hot water. Sarashina has even less gluten than ordinary buckwheat flour so you need hot water to bind it. Sarashina flour is basically pure starch which becomes a sticky paste when you add hot water to it. It should be kneaded thoroughly before the water cools down. After eight minutes of kneading, the dough begins to form lumps. After 15 minutes, lumps have the size of golf balls. Finally, after a long, intense kneading process the dough is formed into one large ball. The next task is to roll it out. The sarashina dough is very fragile and cannot be touched by hands or pressed strongly. It must be rolled flat to an uniform thickness relying only on a thin rolling pin. The final thickness of the dough is 1.2 millimeters and can only be achieved by a real master. The next step is to cut the dough into slender and uniform noodles. The cooking time is only 10 seconds, any longer than that and noodles will fall apart. The timing cannot be even slightly out. After a quick rinse in cold water Sarashina Soba is ready to serve. Besides the fact that each type of soba noodles looks different, it also has its characteristic taste and aroma. Soba noodles are also served in many different ways. Soba noodles are eaten primarily cold and dipped in a sauce known as tsuyu. This sauce is usually prepared from a savory base. The ingredients are likely to include stock from bonito fakes, soy sauce, sweet rice liqueur and sugar. Thanks to this the sauce has a dark color and rich flavor. Often wasabi and finely chopped green onion are added as condiments. Alternatively, soba can be eaten hot. In this case, noodles are served in a hot soup prepared by mixing the broth with the tsuyu sauce used for the cold soba. It dilutes tsuyu enough that it can be drunk like a soup. Variety of the topping opens up numerous possibilities in creating completely different dishes with soba noodles. 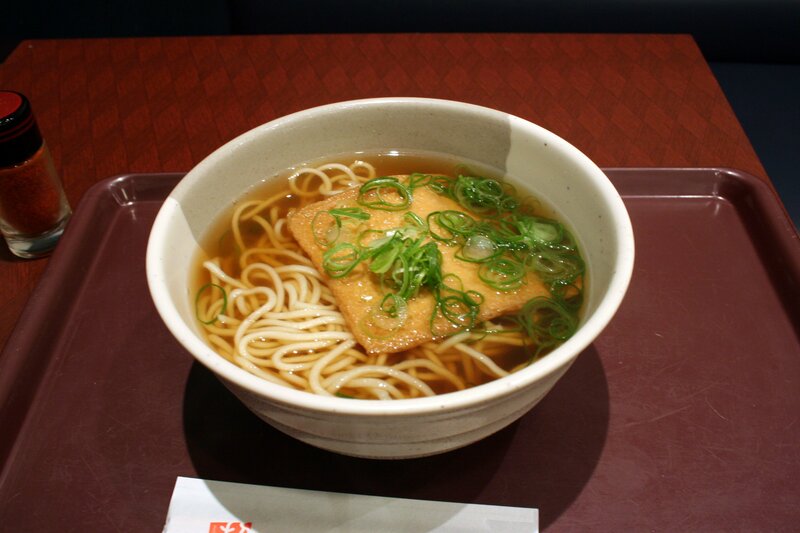 Kitsune Soba are hot noodles served with deep fried tofu. According to Japanese folklore, foxes (kitsune) love fried tofu. Tanuki Soba have morsels of deep fried tempura batter. One of the Japanese’s favorite dishes is Tempura Soba with a few batter fried king shrimps. When you put a raw egg into a hot soup you get a dish with a poetic name Tsukimi or moon-viewing soba. Kamo-nanban Soba has pieces of duck meat arranged on top. These various ways of preparing soba are popular throughout Japan. 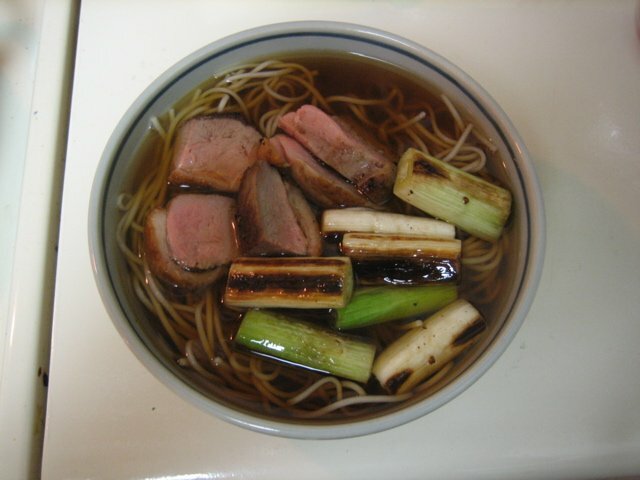 Because it is so simple food you can create many recipes with soba noodles. Soba which is served cold, is called mori soba. This is the most basic dish of soba noodles but there is a specific etiquette and the fundamental rule for eating soba. To get a full aroma, you should slurp the noodles very loudly. Really loud with making plenty of noise. This has even been confirmed in scientific experiments. When we slurp while eating noodles, a large amount of air with the scent of buckwheat enters the mouth and nose together with noodles. It amplifies the aroma. Another important point when eating soba noodles is how we dip it in the tsuyu sauce. 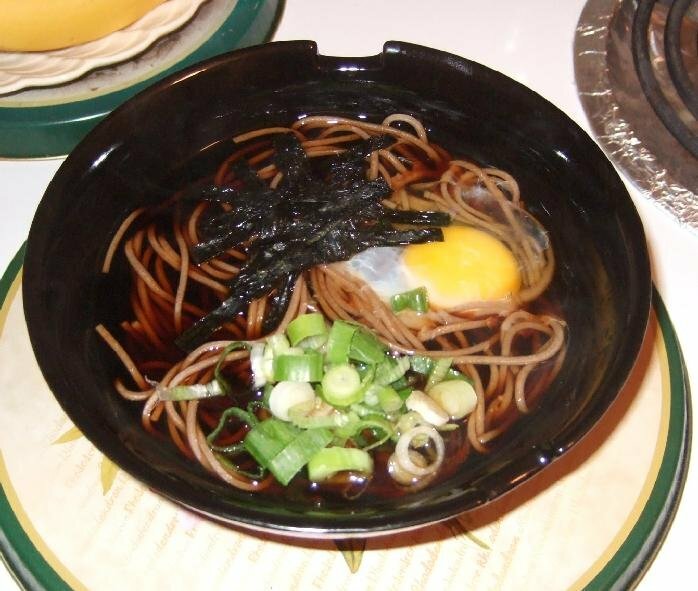 The first bite of soba is often eaten without sauce. This allows you to appreciate the taste and aroma of the noodles without any other flavors. Then the noodles should be immersed in the sauce but not completely. Otherwise, the rich taste of the sauce will become overwhelming to appreciate the taste of the soba. This ensures an optimal balance of taste between soba and savory tsuyu sauce. Once you’ve eaten the whole noodles, you should drink leftover tsuyu. Because it is too salty to drink, it is diluted by adding some hot water in which the soba noodles were boiled. This dish is called soba-yu. In addition to the fact that it warms up your body, soba-yu is also full of nutritional value. Buckwheat flour is sometimes also served in other forms than in the form of noodles. 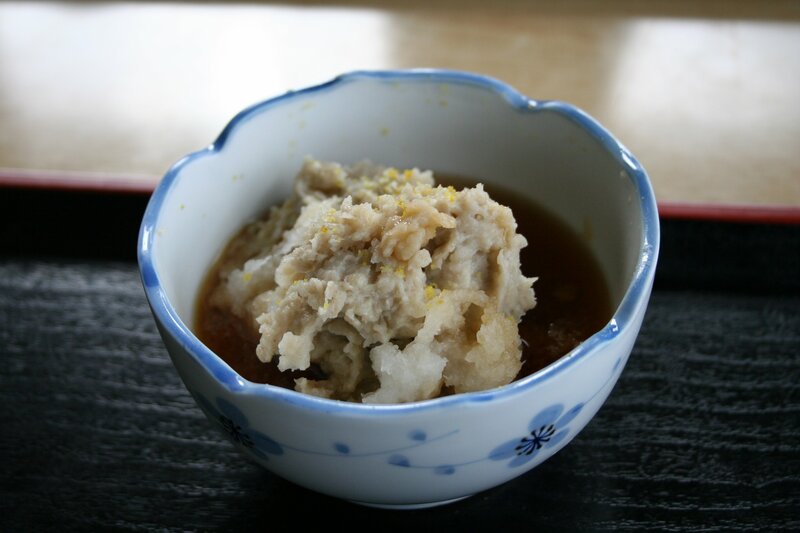 If you pour the buckwheat flour with hot water and then mix it into a thick paste, you will get Sobagaki. These are traditional dumplings that are delicious eaten fresh or grilled by an open fire. Typically, they are served with a soy sauce. Inexpensive and tasty soba noodles are eaten all over Japan but in places that are famous for buckwheat growing, it is also one of the most important elements of local culture. Such a place is Murayama in Yamagata Prefecture, where every year the Soba Festival takes place. Noodles are served on trays with a length of 60 meters which means that it can be eaten by 330 people at the same time. One of the more unusual ways to eat noodles is Wanko Soba, a tradition in Iwate prefecture. Soba noodles are served in small bowls which are refilled as soon as they are empty. When you receive another portion of pasta, you must eat it immediately. So you don’t even have time to catch your breath. Whoever eats the most portions of soba wins. There are restaurants that specialize in Wanko Soba in all of Japan. How do you think, how much would you eat? Mizuhara in Niigata prefecture lies in the mountains. Because the land is mountainous and steep there, there are few flat areas for growing rice. As part of the New Year celebrations, the local population makes buckwheat flour dumplings which are condiments to a sweet red bean soup. Instead of sticky rice dumplings that are used in most regions of Japan. By the end of each year, people in all of Japan buy noodles from local soba shops which are eaten as part of New Year’s rituals. This custom is known as Toshikoshi Soba and it is believed that eating Soba in the New Year will bring happiness to the whole family. Soba noodles are long which according to traditional beliefs, ensures a long, healthy life. The traditional habit of eating soba noodles is deeply rooted in Japan in various forms. In recent years, there has been a boom for preparing Soba noodles at home. Soba making lessons are held throughout Japan and attract many soba lovers. Most of them are middle-aged or older men who want their love to soba strengthen even more. A true soba lover may even become a Sobalier. This word refers to the term somelier which is used for wine experts. Only those who have an encyclopedic knowledge of soba and are master the art of soba making earn the right to be called Sobalier. Soba noodles are a simple dish that at the same time creates many possibilities. Soba is healthy and nutritious, so it’s no surprise that it is one of the Japanese’s favorite meals.